Timber casements, French doors and bi-fold doors from the Mumford & Wood Contemporary range have been used extensively in the self-build design of a Code 4 eco-home in Essex. Every aspect of the design of this bespoke property, which has the majority of living space on the first floor in order to capture the extensive rural views out to the Thames estuary, with bedrooms, bathrooms and dressing rooms to the ground floor, has: a heat exchanger system; a ‘living roof’; under-floor heating throughout, with either granite or cedar floor finishes; extreme levels of insulation; and a window system that will ensure ultimate light, comfort and thermal performance. The homeowner has designed a building that, collectively, will benefit from low or no energy bills, within a cultivable acreage that provides almost total self-sufficiency for the family. Mumford & Wood’s double glazed Contemporary windows and doors are BSI ‘A-C’ energy rated, depending on specification, and achieve an overall frame U-value of 1.4 W/m².K. This satisfies current Part L Building Regulations 2010 and surpasses the requirements of the forthcoming 2013 Regulations. Contemporary timber windows and doors are factory finished with premium quality microporous paint in a wide choice of RAL colours. Alternatively, an aluminium-clad option is available for tilt-turn Contemporary sections which provides a superb weather-proof, low maintenance finish to the exterior and is ideally suited to coastal and exposed locations. Mumford & Wood Contemporary windows and doors are available in open-out configurations, as supplied for this project, or in tilt–turn open-in sections with an aluminium clad option. Bi-fold doors are designed to meet any aperture and opening configuration. Triple glazing options are also available in the tilt turn range with whole window U-values as low as low as 0.8 W/m².K. A full installation service is available to the consumer if required. Sealant products from Tremco illbruck range were used to install the windows and curtain walling on a recent Grand Designs episode. 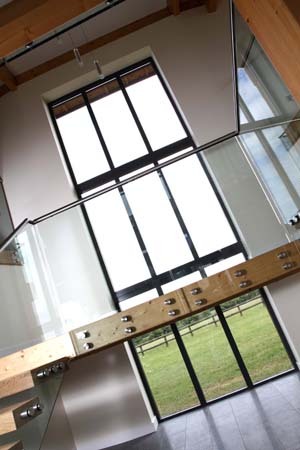 As a manufacturer of balustrade and other architectural metalwork products, Alan Dawson hit on the idea of designing his own answer to achieving the European PassivHaus standards and commissioned Chesterfield-based AM Profiles to provide the critical fenestration and doors for the project. AM Profiles Therm+ curtain walling achieved all of the thermal, aesthetic and other objectives, with the illbruck Duo Window Membrane HD attaining a standard of airtightness far better than required under Building Regulations. The technical designer on the project for AM Profiles, Chris Rigden, said: “We have used Tremco illbruck products on a regular basis and called in the company’s technical manager to consult on this scheme because the client was tying to achieve PassivHaus standards. He duly recommended Duo Window Membrane HD with Tremflex 40 adhesive used to secure it in place around the frames. “Our Therm+ system features timber profiles, protected by an aluminium capping, which has two layers of glass set into it using special frame gaskets to achieve the energy performance. We made up one of the largest screens here in our Chesterfield plant and fitted the illbruck Duo Window Membrane HD around it ready for delivery, while the client made up the rest of the frames himself. Again the illbruck Duo Window Membrane HD was employed to seal the units in between the structural posts. Able to offer an airtightness of 600 Pascals, which actually exceeds PassivHaus performance, the illbruck Duo Window Membrane HD was supplied to the client in a non-standard 200 mm width in order to coordinate with the frame dimensions. 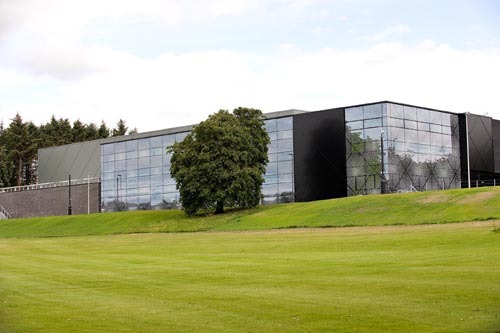 Lancaster University’s new £20m Sports Centre is to open its door on August 1st. The state-of-the-art centre will be open to staff, students, schools and the local community. The 25m eight-lane pool is a third larger than the University’s existing pool. The Sports Centre forms part of the University’s ongoing £350m investment programme in residential, academic and social facilities. The building has been designed to achieve the BREEAM 'Excellent' rating, which sets the standard for best practice in sustainable design. When ARPL architects designed the new £1.5 million Colmonell Primary School in South Ayrshire, they created one of the most energy efficient and eco-friendly schemes in Scotland, including a comprehensive Solar Shading solution from Levolux. The BREEAM ‘Excellent’ rated development demonstrates how contemporary materials and energy efficient building technology can be applied cost-effectively and sympathetically to transform education provision in a small rural community. The school’s design maximises use of natural resources, ensuring all internal spaces benefit from natural ventilation and natural daylight. A south-facing 13m wide by 4m high vertical glazed projection, set immediately behind and above the reception area, not only creates an attractive focal point, but also performs a vital role. It enables natural daylight to penetrate deep into the core of the single storey building. Levolux was approached to develop a solution, comprising its internal motorised roller blinds and external aerofoil fins, to control light, heat and glare levels. The largest Awadukt Thermo ground-air heat exchanger system ever installed in Scotland can now be seen at the newly refurbished and extended Banff and Buchan College in Fraserburgh. The benefits of the passive cooling capability were a significant factor in it being chosen to provide a healthy and comfortable learning environment. 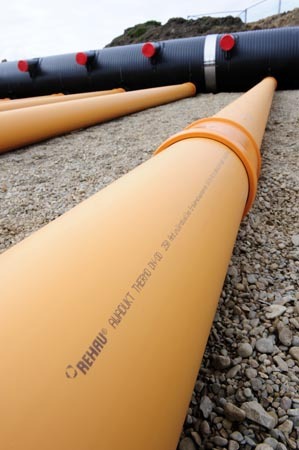 The Rehau system draws air from outside at a rate of 16000m³/Hr through a 42m x 30m grid of Rehau Awadukt Thermo polypropylene pipework, 1.5m below the playing fields of the college. This allows optimal heat transfer to take place between the ground and the air so resulting in the air being warmed by up to 9ºC in winter and cooled by as much as 14ºC in summer by the time it reaches the air handling unit (AHU). This will have a significant impact on the energy loading of the AHU and will eliminate the requirement for refrigerant-based mechanical cooling to counter the heat gain in the building generated by high occupancy levels and large amounts of glazing, particularly in the atrium. Senior mechanical engineer, Alan Gibb from KJ Tait Engineers specified the system in response to requests from the client for an energy efficient heating and ventilation system to assist with their aspirations to successfully secure a ‘very good’ BREEAM rating. Alan said: “On a sunny summer day when the external ambient temperature could be as high as 25ºC, the system will deliver air to cool the atrium which has been pre-cooled by the ground- air heat exchanger to around 10º-11ºC using minimal amounts of energy and with almost zero running costs. For a building which has no mechanical cooling, this will be hugely rewarding. The installation was carried out by mechanical contractors Sparks Mechanical Services with support from Rehau’s technical team at its Glasgow sales office. The pipework grid comprises 60m of 1050mm diameter socketed header pipe and 1680m of 250mm heat transfer pipe with a 70m run header pipe transferring air into the building. KJ Tait will be monitoring the temperature of the air entering the air handling unit via BMS readings as it evaluates the performance and payback of the Rehau Awadukt Thermo system over its first year in operation. The Banff and Buchan FE college refurbishment and extension is being carried out by Robertson Construction Northern Ltd and is expected to be completed at the end of 2011. Solar panels installed by Kier Stoke on the roof of Stoke-on-Trent City Council’s Civic Centre have generated enough electricity to power the average home for a year – in just one month. Kier Stoke, the council’s social housing maintenance provider, fitted 198 panels onto the south and south-west facing roofs of the council’s offices in Stoke. In just the first month since installation they have already generated 4,128kWh of electricity – latest figures from the Department for Energy and Climate Change show that the average domestic electricity consumption per house in the city is 3,638kWh. Under the government’s Feed In Tariff (FIT) for generating zero carbon electricity, the panels have already delivered the equivalent of £1,750 in income and savings. The FIT rewards the owners of installed photovoltaic panels with regular payments for the energy generated during a 25-year period, to repay the capital cost of purchasing and maintaining the systems. It is estimated the panels will generate 30,000kWh of energy every year and will reduce the council’s carbon dioxide emissions by 400 tonnes over their lifetime. Kier Building Maintenance West managing director, David Mawson, said: “As a business, Kier Stoke is committed to working with Stoke-On-Trent City Council to provide a sustainable energy future for the city and fully supports the government’s targets to reduce household carbon emissions by 29% by 2020. Balfour Beatty Engineering Services (BBES) has been awarded the electrical infrastructure contract for the extension of Scottish Power Renewables’ Whitelee Wind Farm. Located at Eaglesham Moor to the south of Glasgow, Whitelee is already the largest onshore wind farm in Europe with the existing 140 turbines having the capacity to generate 322MW, enough to power around 180,000 homes. The extension will add another 75 turbines raising the generating capacity to 539MW, enough to power about 300,000 homes. The extension will see 69 Alstom ECO 100 turbines added, each with a 3MW capacity and six ECO 74 turbines with 1.67MW capacity each. BBES was an integral part of the team responsible for delivering the first phase of the project ahead of schedule. For the extension, BBES will be working with John Sisk and Son and Roadbridge (Sisk Roadbridge JV) to provide the electrical infrastructure works including the substation and control building services, the supply and installation of switchgear and the installation of around 400,000 metres of power and control cabling. The project is due to be completed in 2012. Social housing tenants in the West Midlands are celebrating massive savings on their heating bills following the installation of ground source heat pumps from Danfoss Heat Pumps UK. The tenants live in a low-rise block of flats in Knowle, constructed in the 1970s and now part of Solihull Housing Association’s stock of 10,500 homes. The housing association decided to trial a range of renewable technologies at its properties to reduce carbon emissions and help tenants avoid fuel poverty, which is defined as spending 10% or more of household income on domestic heating. The pilot project included five ground source heat pumps installed in the block of flats and fed through vertical bore holes, along with solar thermal panels and air source heat pumps at other properties. The installation was carried out under a framework agreement with British Gas which specified Danfoss Heat Pumps UK’s 6Kw DHPH6 Opti-Pro pumps. Each pump has an integral 180 litre hot water tank and is powered with energy sourced from125m deep vertical boreholes which have been drilled in land behind the block. The heat pumps supply all the space and hot water for the one and two-bedroom homes and were installed in the airing cupboard of each flat, replacing the existing hot water cylinders, with no loss of living space. Radiators were fitted in place of the bulky storage heaters and the building’s insulation was also improved to maximise their efficiency. Youngsters from military families in Gloucester are living the ‘green’ life in a new eco-friendly nursery building which has drawn praise from judges in a prestigious building awards competition. Working with industry partner Debut Services, Defence Infrastructure Organisation (DIO) delivered the nursery at Imjin Barracks as part of new facilities for troops from the Allied Rapid Reaction Corps (ARRC), one of NATO’s front-line high readiness forces. The building was a finalist in the RICS South West Awards 2011, prompting judges to describe it as ‘a sustainable, energy efficient building providing a good standard of accommodation and facilities serving the Barracks and adjoining residential area’. Shortlisted for an award in the Sustainability category, the building provides a high-quality environment for the children of service personnel with light airy spaces in a highly energy efficient building. 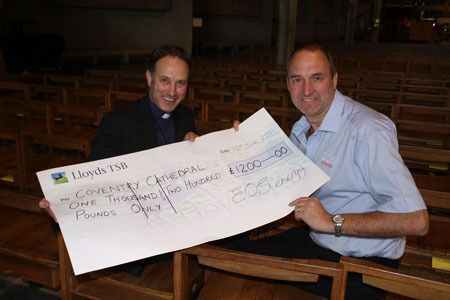 DIO project manager Steve Jeffries said: “Our top priority is to support our Armed Forces and their families. We are delighted that the RICS judges have recognised the work which went into ensuring that both youngsters and staff enjoy a building which is so eco-friendly. The building was designed so that low winter sun enters deep into the building, providing high levels of natural daylight. The structure’s well insulated building envelope keeps the interior of the building warm in winter and cool in summer. Most activity rooms are located to the south, providing bright airy spaces for children to play in. South spaces are high so that they gather maximum sunlight and north spaces, such as offices and the kitchen, are low. The nursery exceeds environmental standards for buildings (scoring the equivalent to the BREEAM industry standard of ‘Excellent’). It incorporates many sustainable features such as: a wind turbine; sedum roof; solar water heating; rainwater harvesting; and zoned lighting. Products from the Dulux Trade Ecosure range of high performing sustainable paints have been used in the refurbishment of Natural Retreat’s lavish eco friendly holiday accommodation in Richmond, North Yorkshire. Dulux Trade Ecosure Matt and Ecosure Quick Drying Eggshell were chosen to revamp 20 eco residences, as part of the hotel company’s continuing dedication to implementing responsible practices within its accommodation. Natural Retreats provide high quality, self catering holiday homes in ten idyllic locations across the UK and Ireland. The contemporary residences indulge guests without compromising on environmental principles. The Richmond site, set in the Yorkshire Dales, is brimming with eco initiatives, including green build technology and a wildlife management plan. It has been awarded the Green Tourism Gold Award for its sustainable credentials and design. Dulux Trade Ecosure Matt was specified for all interior walls and ceilings in the retreats. Developed in conjunction with independent sustainability experts, Forum for the Future, Ecosure Matt has been specifically formulated to have 35% less embodied carbon than standard Dulux Trade Vinyl Matt products. In addition, the paint contains virtually zero VOCs and its packaging comprises at least 25% recycled content. To provide a natural finish, Dulux Trade Ecosure Quick Drying Eggshell was applied to all of the woodwork. Created to provide a tough, durable finish, Dulux Trade Ecosure Quick Drying Eggshell offers good opacity and adhesion. In addition, it has 10% less embodied carbon and 20% less VOC content than standard eggshell products. Eco Building Products has supplied the photovoltaic (PV) panels for an installation on the roof of Long Sutton Primary School in Lincolnshire. Eco Building Products supplied 42 Hyundai 230 Watt photovoltaic panels containing polycrystalline modules for the installation, which will generate more than 9kW of electricity for the school when operating at full power. This has substantially reduced the school’s bills for electricity from the grid. Lark Energy, the newest company in the Larkfleet Group, oversaw the planning and installation of the project and installation of the panels, working closely with local group partners including accredited Micro Generation Certified Scheme (MCS) installers FE Peacock and Cawood Electrical. Long Sutton Primary School will also benefit from the government’s Feed in Tariff (FIT), which guarantees payments for the generation of energy from renewable energy technologies such as photovoltaic panels. The school’s governing body is re-investing the money generated from FIT in further energy-efficiency projects at the school. The new installation is just the first part of the school’s ambition to achieve success on its ‘environmental journey’ in the Eco Schools scheme. It is currently working towards the Bronze award which it is estimated the school will achieve over the next school term. The school governing body’s long term vision is to reduce energy consumption, carbon emissions and energy costs at the school. At the same time it is seeking to engage the pupils and staff with coordinating its current sustainability activities such as waste recycling and monitoring energy usage with its teaching and environmental education goals. School bursar Mark Lunn, said: “Long Sutton Primary is a friendly, exciting school to learn in. We pride ourselves on making education stimulating, meaningful and fun and wholeheartedly believe in teaching our children the value and importance of how to look after our environment. A leading UK high street retailer is on track to make energy savings of £30,000 a year at its half a million square-foot distribution warehouse in the Midlands, thanks to the installation of lighting control systems from Ex-Or, the Honeywell-owned lighting management company. The retailer took over the business park unit early in 2010 and the refurbishment of the lighting system was undertaken by M&E contractors Imtech G&H. Phase 1 of the contract comprised the upgrading of the lighting from SON discharge lamps units to more efficient 80w fluorescents installed in blocks of four in high bay fittings, controlled from a high level bus bar. Imtech G&H project engineer Ian Pattenden explained that Phase 1 involved that part of the warehouse used as its national seasonal stock distribution centre. "Because of the seasonal nature of the products, and the fact that at certain times of the year there would be very few personnel in that part of the unit, it was vital that all unnecessary use of lighting would be automatically eliminated. "The SON discharge lamps were not capable of being controlled or dimmed effectively, nor did they suit the high density racking layout which extended upwards to 15m. We needed a minimum of 200 lux lighting level with the ability to control high level lighting." Ex-Or Hi-Bay LightSpot presence-detecting controls, specially designed to eliminate unnecessary use of lighting in buildings with greater ceiling heights, formed the basis of the lighting control system in the warehouse. Distribution hubs and storage facilities such as this are increasing in height to enable operators to maximise the value of the land footprint occupied by the building. However, stacking higher can lead to higher energy costs – in particular, large internal areas can remain lit despite being unoccupied for much of the time. Like all LightSpot systems, Hi-Bay employs presence detection technology which enables the lighting to respond to any movement that occurs, however small, when the monitored area is occupied. Anyone entering the monitored area automatically activates the lighting and subsequently sustains it by the movements they make as they go about their normal working activity. When the area is vacated, the lights automatically switch off. In any warehouse and storage application, especially where there are a large number of racking aisles, precise lighting control is needed. The Ex-Or Hi-Bay LightSpot detectors provide a narrow angle of view despite the fact they are mounted at great height. This means that much smaller and more precisely targeted internal areas can be monitored by Hi-Bay so that lighting can be delivered where it is needed with much greater precision. Imtech G&H is installing Ex-Or lighting control and management systems into Phases 2 and 3 at the warehouse. Firefly Solar, designer and manufacturer of off-grid, portable and permanent solar-powered generators, has won a contract from Coca-Cola Enterprises to supply six of its Cygnus generators to power the company’s Event Recycling programme at outdoor events in Great Britain and France. Coca-Cola Enterprises (CCE) piloted its Event Recycling programme during 2010 with the objective to motivate festival goers to make recycling a daily habit. 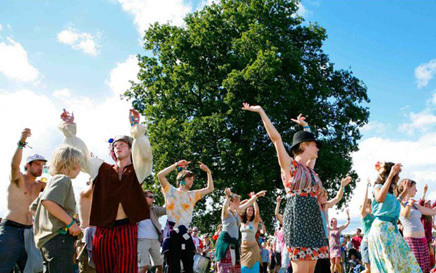 The Programme recovered over 18 tonnes of recyclate (PET and cans) and reached an audience in excess of half a million people attending eight festivals during the summer of 2010. The equipment being supplied by Firefly Solar consists of two standalone solar power systems comprised of three of the company’s 5kW Cygnus solar generators, configured to provide a three-phase 5kW electrical supply. One system each will be supplied to the British and French teams to provide electrical power for waste compaction equipment and for portable office space at this year’s events. Cygnus is a compact and high quality, forklift-able solar generator. With a footprint of less than 1m2 (excluding solar array), Cygnus generator’s built in battery bank can be charged using a range of renewable sources including solar, wind and pedal power – it can even be charged using the excess capacity of biodiesel or hydrogen generators or from a green mains supply. 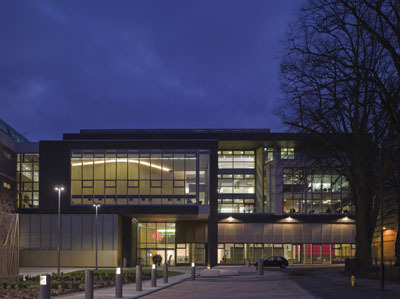 Lancaster University has delivered the UK’s first higher education building project to be rated ‘outstanding’ by the environmental performance measure BREEAM for both design stage and post construction review. The University has been awarded this distinction for its £10m Lancaster Institute for Contemporary Arts (LICA). The timber-framed building is home to Art, Design, Film, Music and Theatre Studies as well as LIVE@LICA which combines three public arts facilities; the Peter Scott Gallery, the Nuffield Theatre and the International Concert Series. The pre-fabricated and cross-laminated timber structure provides high levels of air tightness and enabled a quick and safe construction programme. Mark Swindlehurst, Lancaster University Director of Facilities said: “We are delighted that Lancaster has been recognised as a pioneer of sustainable building in the Higher Education sector. 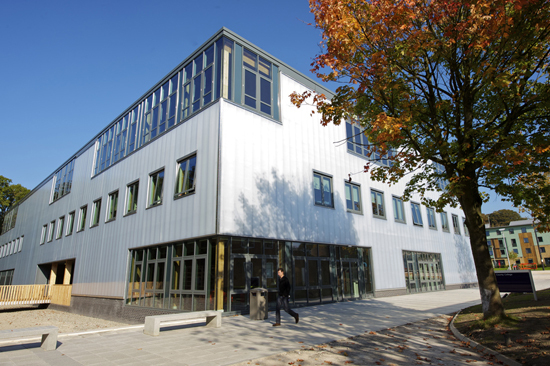 In addition to the ‘Outstanding’ LICA building, to date the University has delivered nine BREEAM excellent new build developments, including the £20m Sports Centre opening in August. Sheppard Robson, the architects who designed the LICA building, has also just been listed as one of the Sunday Times Top 60 Best Green Companies 2011 (ranked 40th). The University is committed to sustainability and to reducing its carbon footprint. For example, a wind turbine will be built on campus in 2012. Other projects include replacing the University’s main boilers, installing a Combined Heat and Power (CHP) Unit and plans to install a biomass boiler. The University is expanding its carbon saving competitions for students and is currently targeting staff to help them to improve energy efficiency in their work areas as well as implementing dozens of small scale energy and water saving projects to get everyone thinking about the way in which they use energy and the way in which they can contribute to carbon reduction. Completion of all these projects over the next three years would reduce carbon emissions by over 30%, well on the way to the very challenging Higher Education sector target of cutting carbon emissions by 43% by 2020. Results of the Staff Travel Survey show a 70% increase in bus use among staff since 2007, a 17% increase in car sharing and women cycling to work up by 35% (8% overall). 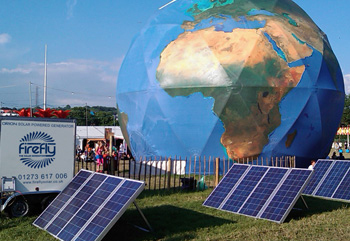 For the last three years CAT and Shambala have been working together with the aim of making Shambala the greenest UK festival by producing the most detailed carbon audit of any UK event. This year, Shambala achieved the highest ever rating from the Industry Green assessment, and, alongside CAT, have been working with Julie’s Bicycle (www.juliesbicycle.com) to make changes at Industry level. “Shambala is 99% powered by wind, sun and waste vegetable oil and has been judged the greenest outdoor event by Industry Green and A Greener Festival,” Sidharth Sharma, director and creative coordinator of Shambala festival, said. This year CAT is teaming up with Shambala to demonstrate sustainable building to festival goers. As part of a shared commitment to sustainable futures (and having fun), the CAT team will be on site showing what can be constructed with natural raw materials. "Houses out of hemp, walls out of willow, towers out of timber, structures out of straw and arches out of earth – come and help us explore the new worlds of zero-carbon building!" said Peter Harper from CAT. When the Hon MP for North West Leicestershire Andrew Bridgen commissioned a new-build home, he was keen to use a renewable energy system that would reduce his carbon footprint and lower his energy bills. The 581m2 property was built near Swadlincote in Derbyshire and is fitted with a ground source heat pump from Danfoss Heat Pumps UK to supply all of its hot water and space heating requirements. 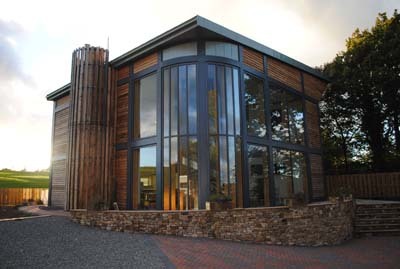 The project has been shortlisted in the ‘Installation of the Year’ category at this year’s National Heat Pump Awards. The Conservative MP, who has campaigned on environmental issues, investigated a range of heating alternatives for his spacious five-bedroomed home, which also contains a cinema, gym and billiard room. Mr Bridgen was advised by renewable energy specialists Eartheat of Leicester that a ground source heat pump was the most sustainable and cost effective solution to his space and water heating requirements. Although Mr Bridgen and his family originally planned to live in the house he was selected as the parliamentary candidate for the neighbouring county, so has since put the house on the market. The property was designed and built by Bridges Developments of Derbyshire that specialises in low carbon properties. Managing director John Bridges said: “There were a range of challenges on this project, in particular the issue of achieving a high level of energy efficiency within a realistic budget. This involved a complete redesign of the original plan and we decided upon an innovative technique which used an insulated concrete form construction. This is a cost effective method of achieving a very high level of thermal efficiency. Because of the high level of air tightness achieved by the concrete walls, Eartheat was able to specify a 16kW heat pump, which is smaller than would usually be required for a new build property of this size and therefore uses less electricity. A DHP-H Opti Pro heat pump system was installed with an additional 200 litre hot water cylinder to supplement the pump’s internal 180 litre tank. Figures recorded over the first six months show that the system will supply an estimated 49,000kWh of energy per year, while consuming just 11,000 kWh of electricity. The pump is supplied by a ground loop buried in horizontal trenches, which extracts heat from the ground. It provides continuous hot water and feeds an underfloor heating system, which runs throughout the three-storey property. The DHP-Opti Pro pump is one of the most advanced on the market and incorporates an intelligent control system on the circulation pumps to ensure maximum efficiency. 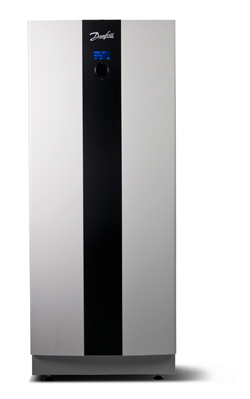 It supplies both space and water heating and includes the latest HG technology, using the compressor as a ‘super heater’ to raise the temperature of the domestic hot water supply. The solar array will cover 90,000m2 of industrial land – enough to cover almost four and a half football pitches. The energy generated by the solar panels will be used to help reduce the plant’s carbon footprint, saving up to 2,000 tonnes of CO2 emissions a year. 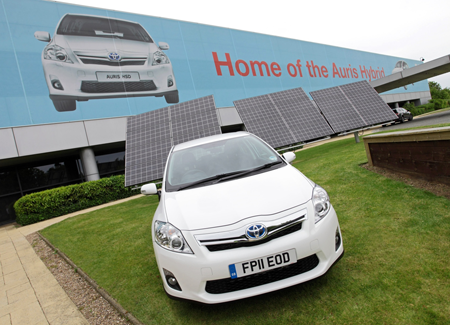 When fully operational the solar array will be capable of supplying enough energy to build approximately 7,000 cars a year at the Derbyshire-based plant, where Auris, Auris Hybridand Avensis are manufactured. The solar array, a joint project between Toyota and British Gas, is expected to begin supplying power to the plant in July. The development is a key part of Toyota’s ‘Sustainable Plant’ vision in which manufacturing operations are designed to work in harmony with their local community and surrounding environment. Burnaston is one of just five Toyota plants worldwide to be designated a Sustainable Plant with first-rate environmental credentials. The Caledonian Group has been selected for contracts worth £15 million to build accommodation facilities at Sullom Voe on the Shetland Islands. Caledonian’s off-site construction approach was chosen to enable the efficient construction of high quality, energy efficient and functional buildings in this remote and windy location. The new buildings include 424 bedrooms and will provide accommodation, which is currently in short supply in this area, for construction workers building a new processing plant to service the Laggan and Tormore gas fields to the north of the Shetland Islands. The gas fields are to be developed by Total E&P UK and DONG E&P (UK) and the processing plant’s construction is expected to require 850 construction workers at its peak. The facility is designed in the style of a two storey hotel, and the accommodation blocks consist of five adjoining buildings. They will be connected to an amenity building providing a comprehensive range of services for the construction workers including a restaurant, laundry facilities, common lounge areas, a gym, reading rooms, health facilities and a prayer room. Over 200 solar panels will provide renewable energy to heat the domestic hot water used by the building’s residents. For maximum efficiency and to ensure the highest quality, fit outs will largely be completed off-site and prior to installation by The Caledonian Group. Bedrooms will be installed already completed with decoration, en-suite bathrooms, fitted furniture and beds. Completing external cladding panels and the permanent roof off-site will also reduce the need for work on site. In addition, vertical timber boarding and large glazed panels will be applied prior to installation. 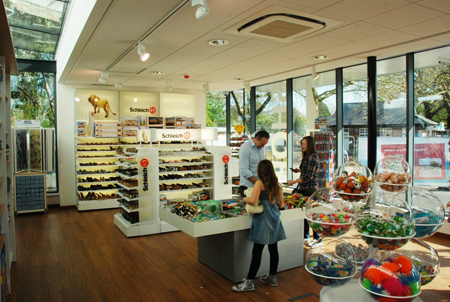 The extension to ZSL’s London Zoo’s main gift shop, next to its new exhibit ‘Penguin Beach’, will benefit from the energy-saving properties of Dow Floormateä insulation supplied by Panel Systems. It was important on this project that the floor insulation met all thermal performance requirements and that it could be supplied and fitted quickly to meet the tight build schedule, so the gift shop could open in time for the summer season. Architects Wharmby Kozdon specified Styrofoam Floormate 300-A grade floor insulation for the new shop that has a floor area of 500m2, which is suitable for medium to heavy foot traffic, as the shop attracts over 1m visitors per year. Floormate, which is manufactured from Styrofoam extruded polystyrene, was selected for its high compressive strength, durability and its excellent thermal performance. Floormate is available in a range of grades, which gives it the flexibility to be used as floor insulation for both new build, extensions or DIY home improvement projects. The client was confident about the performance of the product as Floormate has previously been specified for another of London Zoo’s buildings. Installable above or below ground bearing concrete slabs, Floormate can also be suspended in beam and block or timber floors. The position of the insulation depends upon when the building will be heated. When heating is intermittent, for example in homes, Floormate should be placed above concrete slabs, so that the building can heat up quickly. In hospitals, schools and factories, Floormate should be placed below the slab so as to retain heat for long periods. Norfolk-based Parsons & Whittley architects employed Passivhaus principles in the design of what is set to be the UK’s first rural affordable housing scheme to gain Passivhaus certification in Wimbish, Essex. 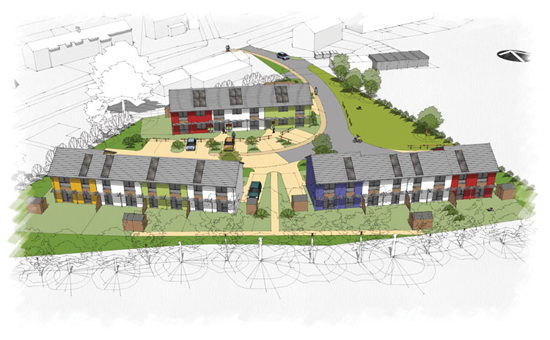 A 14 dwelling Hastoe Housing Association development in the village of Wimbish, Essex, is a green-field scheme being built under the exception site policy to address local housing needs with funding from the Homes and Communities Agency and investment from Hastoe. Besides providing much needed affordable homes for a rural community the scheme is aiming for high levels of sustainability in order to address fuel poverty and climate change concerns. 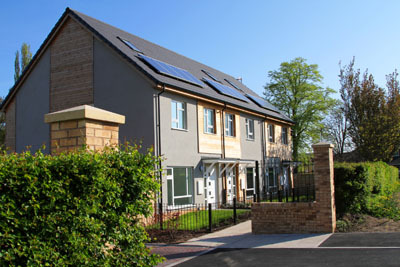 The houses, a mixture of homes for rent and shared ownership, are designed to be super energy efficient, complying with Passivhaus principles and Level 4 of the Code for Sustainable Homes. Passivhaus standard buildings retain heat created within the dwelling as well as from passive solar gain, eliminating the need for central heating and reducing fuel costs. The standard requires very high levels of insulation (in order to meet U-values of below 0.15 W/m2K for walls, roof and floor), a design that makes the most of solar energy, and superb sealing throughout. Promoted by the Passivhaus Institute in Darmstadt, Germany, there are around 25,000 Passivhaus buildings worldwide, the majority of them in Germany and Austria. The approach is growing in popularity in the UK as developers strive to meet zero carbon targets. A number of construction options were evaluated before adopting 190mm solid aircrete external walls wrapped externally in 285mm of rendered insulation. With extruded polystyrene insulation running under the reinforced concrete ground floor slab, and conventional standard trussed rafter roofs supporting 500mm Crown Loft Roll, the construction details have been kept simple and effective meaning they can easily be replicated. Key to effective insulation was the use of a new blue extruded polystyrene foam insulation, which runs below the concrete floor slabs creating an envelope of continuous insulation which minimises heat loss. Having a design load of 130 kN/m2 and is highly durable with excellent moisture-resistance and compressive strength, enabling the insulation to perform outside the waterproofing envelope. Installing insulation below the slab helps to avoid thermal bridges at floor and wall junctions and makes the most of precious internal space, meaning it is fast becoming recognised as an effective way of insulating new buildings. Dwelling forms have been kept deliberately simple at the Hastoe development to avoid thermal bridging risks and porches, meter boxes and Brise Soleil are all independently supported to avoid penetrating the insulation overcoat. East-West orientation of the blocks facilitates passive solar gains with careful attention to shading to avoid summer overheating. The design and construction methods also assisted the incredibly low air tightness requirement of 0.6 air changes per hour, with internal wet plaster providing the majority of the barrier and all joins covered in specialist membranes or tapes.